1979 Tennessee Inspection sticker (Memphis) - $20.00 : Bob Hoyts Classic Inspection Stickers, Add a Final Touch to your Restoration! Tennessee did have inspection stickers but in individual cities? 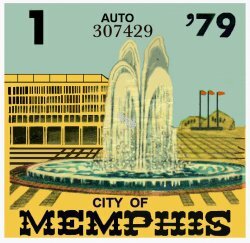 Here is a 1979 Memphis Tennessee sticker issued as tax and inspection. This sticker has been restored and reproduced directly from an original. It has our patented "Peel and Stick" format which allows you affix it to the inside of your windshield. Buyer can customize this sticker with your personal license plate number where the serial number now is for an additional $10.00. Our thanks to Paul Craft, Houma, LA for providing us with the original.